Read through the Preface and Introduction (Chinese Etymology). This read-through is the “big picture” regarding how the Chinese language is organized and structured. The ideas, concepts, and terminology introduced here will be referenced throughout the remainder of the course. I began my studies on March 17, 2008 and I read through the Preface and Introduction and completed Assignment 2 in about an hour. Before now, I always thought Chinese words were blurry blobs of over zealous brush strokes that seemed to have absolutely no sense or logic whatsoever. I can remember thinking, how can those scribbles mean anything? I dabbled grade school finger paintings that made more sense. Of course, I was horribly naive and ignorant. 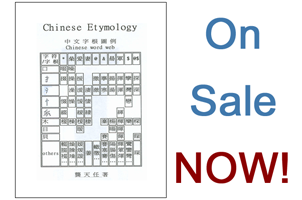 After reading the preface and introduction of Chinese Etymology I realized that not only does the Chinese language have logic, it has perfect logic! Being a network engineer and computer programmer, I understood the idea of word roots and sound modules quite easily. It made sense to me that if we can instruct computers to do billions of different tasks by using merely zeros and ones (the binary language) why should it not be possible in a world language, such as Chinese, to use 220 word roots and 300 sound modules? I was very excited and continued to study!